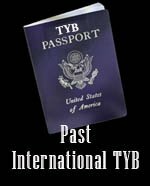 The TYB passport is back! This is my first time on European soil. I was honored to accompany my Jujitsu Blackbelt friend, Nathan Mendelson, who was competing in the European BJJ tournament in Lisbon, Portugal. The first few days of the trip we didn't really party because we were there for the competition but I was not competing so I had no problem working my way into the hotel bar. My first cold beverage was a Sagres beer off the tap. This is one of the more popular beers of the country, sold everywhere. Not much I could say about this beer. It left a corn syrup after-taste in my mouth, I wasn't into it. After chatting with the bartender, Alterto Silva at the Hotel Luticia, I switched over to Super Bock. Super Bock is also popular and sold everywhere. This beer was really smooth and dark in color, it tasted like a Medelo, one of my staples back home. I mostly drank Super Bock the rest of the trip. The Bock Strong was even darker, and real sweet. I wasn't into it but I thought it would be great with dessert. I believe they target it as a dessert beverage. I didn't try any special cocktails except a Caipirinha, which is made from 51 Cachaca, from Brasil. I did have several glasses of cheap red wine. I wasn't that impressed. The Port on the other hand was spectacular. Real Port wine comes from specific regions of Portugal and has a specific taste, body and aroma. Drinking a bottle of Port wine is a must if traveling through Portugal. Lisbon, the capitol of Portugal, has a wild nightlife. Calm during the day but when the sun goes down the city comes alive. It's one hell of a party. Seven days a week, all year long! Happy Hour is spent chilling on a patio bar, or on a balcony, admiring the beautiful colors of the old city. The waterfront is also a perfect place to have a drink, eat and enjoy the skyline. I would recommend immersing yourself into some Portuguese culture at a Fado music house, and enjoying some Port. Their are plenty of places to eat and drink when waiting for the electronic dance houses to open at 2am. Trust me, the night will not be boring. I visited the small fishing village of Nazare. Nazare has become a popular international tourist attraction. Located on the Atlantic coast, it has long sandy beaches, (Considered by some to be among the best beaches in Portugal.) with lots of tourists in the summer. The town is known for traditional costumes worn by the fishermen and their wives. The wives wear traditional head scarfs and embroidered aprons, over flannel skirts of different colors. These dresses can still occasionally be seen today. It's also common to see the locals drinking wine by 11 am. My friend Nathan and I spent two days drinking Super Bock out of tall cans at the huge wave spot in Nazare, or known by the locals as North Beach. When mother nature works her magic you can see waves break as big as 100 ft.! We got it on a small day with waves up to 20ft. and just a few guys out tow surfing. They got some great rides while paying their dues. This is a great spot if you only have a few days in Portugal, only an hour and a half drive north from Lisbon. Beautiful landscapes and the crazy party go hand in hand with these amazing and humble people. The food and drink was good but not spectacular. I would recommend visiting this wonderful country solo, or in a group, and put it high on the list for your Latin European destinations.